-Our first glimpse into the Boyle household and Lesters disdain for Ethel. -The family trip to Kings Island ends in disaster. -Lester finally calls up Adams Late Show to make fun of him. -Lester and Robert appear on Wheel of Fortune. -Lester calls up an unknowing Steve Cannon to talk about Adam. -Lester gets a call from an ad agency to do some embarrassing commercials. -The family trip up to Columbus to see Red, White, and Boom! -Lester and Johnny decide to go down to the station and take over. 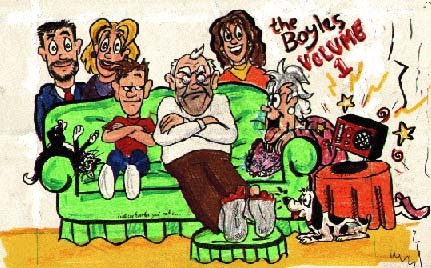 The introduction to the first ever "Cartoon on Radio", The Boyles - Volume 1 introduces the entire family with the first 10 episodes ever aired on 610 WTVN AM in Columbus, Ohio. Follow Lester and the rest of the family from King's Island to Wheel of Fortune to Red, White & Boom! You can't help but fall in love with the "family from West Virginia" once you've finished this cassette. 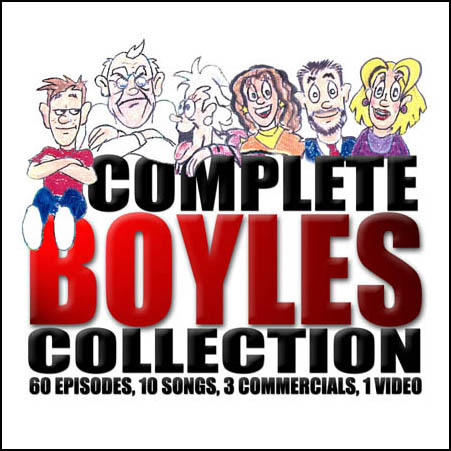 Only 100 copies were ever made, and can now only be found through the Complete Boyles Collection mp3 CD.